Arachnids have nearly as much species diversity as their distant cousins, the insects. Spiders and ticks make up the vast majority of arachnids, although the class also contains the scorpions, vinegaroons, whipscorpions, harvestmen and camel spiders. Levels of parental care vary between species and orders, but all arachnids have incomplete metamorphosis, meaning the babies look very much like miniature replicas of the adults. Courtship among arachnids often is a spectacle, including various gestures, touches, dances and, sometimes, sound. 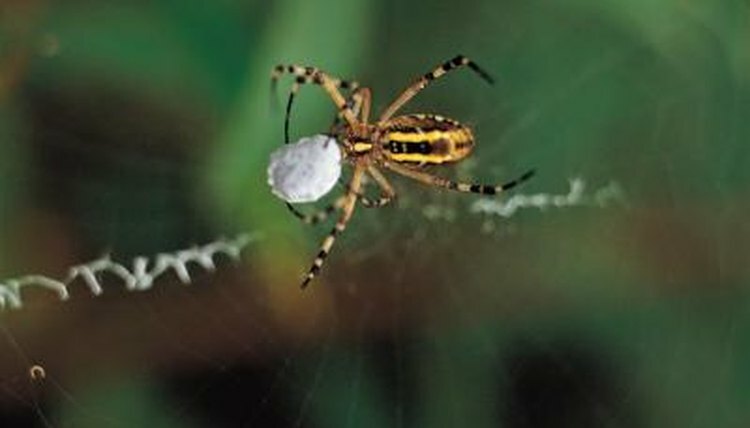 Spiders use their pedipalps to transfer sperm into the female's genital opening. A male scorpion guides his mate over to a sperm packet he's deposited. Ticks mate while the female is attached to her host. It's not uncommon for the male to become dinner to his mated partner, particularly in spiders and scorpions. Some species give birth to live young, although egg-laying is the most common form of birth among arachnids. Female ticks release from their host after mating and feeding, and then lay eggs just before dying. Scorpions give birth to live young. Windscorpions, also known as camel spiders or sun spiders, bury their eggs, as do harvestmen. Different levels of maternal care are shown among arachnids, as well. Baby scorpions climb onto their mother's back until their first molt; some spiderlings do this as well. During the larval and nymph stages, the young arachnids look like their parents, although they are much smaller in size, and sometimes have different coloration and patterns. Molting is a process in which the larvae and nymphs grow and shed their exoskeletons when their bodies become too big for them. Spiders molt between four and 12 times during their lives, while scorpions molt five or six times before they mature. The life span of arachnids varies greatly between species and type. Some scorpions live 10 to 15 years, although the average is 3 to 5. Spiders may live to only 1 year old, but some of the tarantulas are known to live decades. Many harvestmen only live for a year, while ticks may require two years for their life cycle to complete.